Council members Lee Kleinman and Carolyn King Arnold did NOT have their finest day. Councilman Kleinman is ready to rumble. For a thorough explanation of why yesterday’s City Council resolution about DART’s priorities was a big deal, read what Peter Simek posted. Here I’d just like to point out the two council members who I thought performed the worst yesterday. First up is District 4’s representative, Carolyn King Arnold. She was so far over her ski tips yesterday that I almost feel sorry for her. Take the time to appreciate how confused she was. It’s just four minutes. Go to the video here, and cue it up to the 94:00 minute mark. Watch till 97:53. That’s all you need to know. After learning that about half of DART’s funding comes from Dallas, the city whose council she sits on, and that the citizens voted on that funding, Arnold goes on to ask the city attorney about the feasibility of Dallas’ pulling out of Dallas Area Rapid Transit (requires changing state law) or, more reasonably (but impossibly), withholding half of the 1 percent of our sales tax that we give to DART so that we can use it for “another service.” Arnold works hard for her constituents. It’s just that she’s working hard to get a basic understanding of a topic that nearly everyone else in the room already has. Next up is potty-mouthed Lee Kleinman, District 11’s rep. Kleinman is a bit more dangerous than Arnold because he has an MBA in finance, as he reminded everyone in yesterday’s meeting, and because he knows how to peer over his glasses at people. Also, some of what he says at first sounds like it makes sense — until you figure out that he’s working at a higher level than Arnold and therefore making even bigger mistakes. Again, I need you to watch some video. Go to the 58:30 mark and watch till 60:45. Come on. That’s 2 minutes of your day. 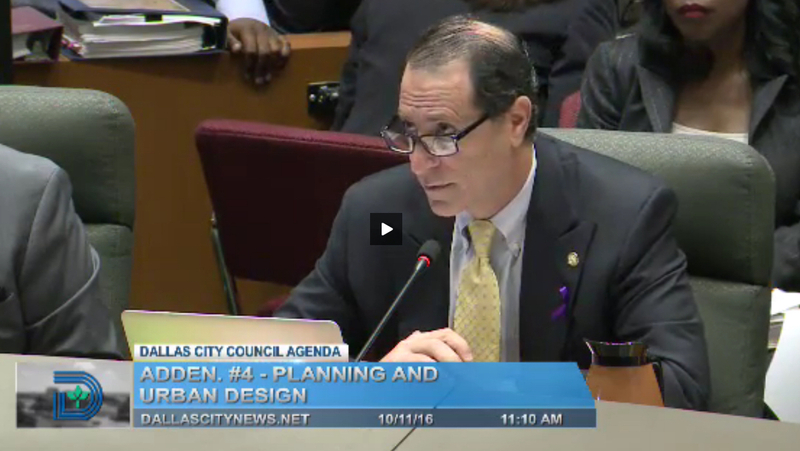 In that brief clip, you will see Kleinman say some amazing things about how DART funds construction and about how certain people aren’t smart enough to understand what he’s talking about. Actually, he delivers one hell of a burn. Speaking hypothetically, he says, “DART failing financially is, no question, problematic.” Probably only Councilwoman Arnold would disagree. But then he says he has challenged the Coalition for a New Dallas to explain how DART’s paying for the northern Cotton Belt Line could put in jeopardy its ability to afford an underground route for D2 (the second, much-needed downtown line). (Disclosure: the Coalition was co-founded by Wick Allison, who owns D Magazine.) Kleinman implies that the Coalition has not risen to this challenge and then explains how DART can afford both projects. First, it will refinance debt. And, second, “a new program has become available.” This is huge. Where DART has previously relied on funds from the Federal Transportation Administration (FTA), it has now found a new program, this one run by the Federal Railroad Administration (FRA). So, if you’re not paying close attention, it sounds like DART has a second source of federal money to pay for construction. Which is true — and very wrong. The FTA money that DART is after is a grant. It hopes the feds give money to DART. But this is a competitive process, and the bucket of money is only so deep for competing agencies around the country. The FTA gives money to a project only if gets people out of cars and riding trains and lessening highway traffic and improving air quality. If the project doesn’t do that stuff, no free money. That’s why the FTA won’t give any money to the Cotton Belt. The FRA and the new program Kleinman has identified? It’s called the Railroad Rehabilitation & Improvement Financing program. Catch that last word? Financing? Under this program, the FRA would loan money to DART. That means debt, and more debt would hurt DART’s position with the FTA, the agency that grants money. The FTA doesn’t like to give money to agencies that are burdened by too much debt. That, my friends, was the aforementioned burn. Tranchin spoke to the Council about an hour earlier. Watch his 3-minute speech at the 4:45 mark. Decide for yourself if he makes sense. Ignore his haircut. Tranchin mentions that he “worked for a few years in D.C.” Kleinman snatched up that tidbit and ran with it, turning him into an intern. Like I say, total burn. For the record, Tranchin worked in the White House, overseeing the Obama administration’s outreach to nonprofits, connecting them with federal grants. He served in the Office of Public Engagement. And he was paid to do it. “Mr. Mayor, thank you for giving me the opportunity to respond. As the executive director of the Coalition for a New Dallas, I was unaware that Councilman Kleinman had issued a challenge to the Coalition to address the problems with DART’s proposed financial plan. We gladly accept the challenge on the condition that our conversation is open to the public so that they, too, can be educated about the risks that the Cotton Belt poses to the D2 subway. Is the City Council Confused About What City They Govern?